‘Real’ American baseball has come to Israel, thanks to American Jewish businessmen connected to Major League Baseball. You can read about it in the link above. For me it brings back memories from 25 years ago, when I coached a baseball team on my kibbutz. The kids enjoyed playing a game called hakafot which was similar to baseball in that it involved hitting a ball with a stick and running, at which point the relationship ended. But American baseball games were televised by a Christian missionary TV station in Lebanon, and my son was immediately hooked. I don’t know why. My son came on aliyah when he was 2-1/2 years old. None of the Israeli-born kids were particularly interested in the games on TV (at first). But somehow my son knew. It was in his genes. Farfour the Hamas mouse is gone, brutally beaten to death by an Israeli official who tried to persuade him to sell his land. But Farfour, patriotic to the end, refused, calling the Israeli a ‘terrorist’. 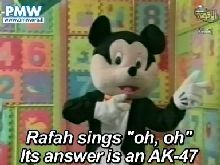 The squeaky-voiced Mickey Mouse lookalike, named Farfur, is the star of a weekly children’s program called Tomorrow’s Pioneers on the official Hamas TV station (Al-Aqsa TV). Farfur and his co-host, a young girl named Saraa’, teach children about such things as the importance of the daily prayers and drinking milk, while taking every opportunity to indoctrinate young viewers with teachings of Islamic supremacy, hatred of Israel and the US and support of “resistance” – the Palestinian euphemism for terror. Well, he’s gone to his 72 black-eyed rodent virgins now, and good riddance. Station personnel say that he has been taken off the air to make room for other programs. Perhaps even Hamas is afraid of Disney’s legal department. The prime minister added that stepping up protection would be “just as [ineffective] as the demand to solve Sderot’s Kassam problem by wiping Beit Hanun and other towns in Gaza off the face of the earth. So…what is your plan? Should part of the sovereign state of Israel be abandoned? Should the remaining residents of Sderot just sit in shelters? What will be different in the long term from the “short term”? Israel’s goal should peace and security, not any particular arrangement of states. But she is unquestionably correct that the road to it, whether or not a Palestinian state is on the way, runs through war. And I would have preferred that she had said “war on Palestinian and other Arab rejectionists” than the nonsensical “war on terror”. Israel a model for Iraq? Or vice versa? It’s really hard to know whether to laugh or to cry. One hopes that Iraq is not the model for a future Israel, with Israeli Jews and Arabs playing the roles of Iraqi Sunnis and Shiites. Unfortunately, the same kind of inability to share a common vision seems to exist, although internal conflict has not taken off as it has in Iraq. It’s pretty certain, though, that conflict with external enemies — Hamas, Hezbollah, perhaps Syria — lies in the near future. And that, like the 2nd Lebanon War, will stress the uneasy relationship still further. Recently I commented on statements issued by the president of Columbia University and the chancellor of the University of California at Berkeley, which criticized the British University and College Union for considering a boycott of Israeli academics and institutions. The future of our world is dependent upon the free interchange of ideas and a discussion of solutions to complex problems. Any actions to stifle interactions among universities and their faculties is counter-productive. Dr. Bollinger has asked the UCU to boycott Columbia too, if they must boycott Israeli institutions; and Dr. Birgeneau has said that they can add UC Berkeley to their list. Here in Fresno, Dr. Welty stands four-square behind academic freedom — as long as we don’t get too specific. I didn’t ask him for his position on apple pie. In his defense, he is presently dealing with several scandals surrounding the university’s Athletic Department. Of course, given the fact that similar scandals erupt with the regularity of Old Faithful (perhaps slightly more frequently), I would expect that he would have developed ways of dealing with other issues by now.